Culture In Scotland – Who Is Missing? 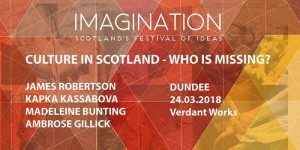 Come and join us in the first of a series of discussions undertaken by Imagination: Scotland’s Festival of Ideas looking at culture in constraining, challenging times. This event examines who and what is missing from culture in Scotland, ranging across people, social groups, voices and perspectives. It asks what is particularly Scottish about this experience, and draws on wider international and universal reflections about the movement of peoples, memories and cultures across Europe, the changing nature of England and Britain, and whether there is a cultural exclusion in Scotland based on generational gridlock? We need to be asking ourselves difficult questions, listen to each other with respect and learn to notice who is inside the official conversations and who isn’t. Then we need to change what we do. Opened by Centre for Scottish Culture associate Gerry Hassan, featuring James Robertson, Kapka Kassabova, Madeleine Bunting and Ambrose Gillick. JAMES ROBERTSON is a poet, novelist, translator and editor. His most recent books are the novel To Be Continued and a biography of Michael Marra, Arrest This Moment. KAPKA KASSABOVA is a poet and writer of journeys, most recently of Border (Granta 2017) which won the Saltire Book of the Year, the Stanford-Dolman Travel Book of the Year, and was short-listed for the Baillie-Gifford Prize and the American National Circle of Critics Award. She is also the author of Street Without a Name (2008) and Twelve Minutes of Love (2011). Kapka Kassabova grew up in Bulgaria, was university-educated in New Zealand and now lives in Scotland. MADELEINE BUNTING is the author of four books. Her most recent, Love of Country, A Hebridean Journey, published in 2016, was shortlisted for the Wainwright and the Saltire Society Prizes. In 2010 ‘The Plot, the story of an English Acre‘ won the Portico Prize and was shortlisted for the Royal Society of Literature’s Ondaatje Prize. Her first novel, Island Song will be published by Granta in 2019. She was a journalist on the Guardian until 2013, and a columnist 2000-2012 winning several prizes for her work on race, identity, global development and faith. She lives in East London and is currently working on a book on care and the crisis of human sustainability, The Labours of Love which will be published by Granta in 2020. She is a regular BBC Radio contributor. AMBROSE GILLICK runs Baxendale, an architecture and art practice in Govan, Glasgow with architect Lee Ivett which focuses on grassroots projects with marginal communities. Baxendale have ongoing work in Dundee, Glasgow, Preston, Easterhouse and Venice. Ambrose has a PhD in architecture from the University of Manchester and has helped write books, make exhibitions, put on conferences and curated shows on modern houses, cities and civic spaces. Both Ambrose and Lee also lecture at the Glasgow School of Art. This season of talks is produced by Gerry Hassan and Andy Summers with Dawn Taylor. The series is supported by Creative Scotland.